Well, I received an email this week letting me know that Hillshire Farm is donating $1500 to ‘The Boys and Girls Club of America‘ in my name as a THANK YOU for competing. I almost fell on the floor because I LOVE The Boys and Girls Club! I’ve worked with them for several years and this is just so amazing!! THANK YOU HILLSHIRE FARM! THANK YOU!!! As if that wasn’t enough goodness, Hillshire sent along some great sandwich making tips that I just HAD to share. · The Ingredients: To keep sandwiches crispy and delicious, the Fresh Squad experts at Hillshire Farm suggest placing a single layer of premium quality lunchmeat on each slice of bread, then spreading the condiments on those. The meat creates a barrier between the bread and the rest of the ingredients. Cheese also works nicely as a barrier. One rule of thumb is to never place tomatoes directly on the cheese – the juice from the tomatoes will make the cheese soft and cause the bread to become soggy. Instead, place tomatoes in between lettuce slices. Cucumbers are also great alternatives for lettuce. · The Storage: Another good defense against sogginess is to pack the separates and let the kids make the sandwiches at school. Bread goes in one bag or container, meat and vegetables in another, and throw in little restaurant packets of mayo or mustard. The Fresh Squad suggests insulated lunch bags as the best choice for school lunches. You can also pack lunchmeat in our re-sealable and re-usable tubs. Some insulated lunch bags are equipped with freezer packs. If not, try freezing juice boxes or reusable bottled waters instead of adding freezer packs. The boxes or bottles will thaw to provide a refreshing beverage and keep the sandwich fresh. · The Bread: Be sure to choose the right bread for your sandwich. Keep in mind that the more moisture in the fillings, the drier and denser the bread should be. Breads with thick crusts work perfectly, or swap your regular bread for flour tortillas, bagels, English muffins or pitas. Grill or toast the bread to add crunch and flavor. Keep wet ingredients from making your sandwiches soggy by adding a light layer of butter to the bread. Get creative with cookie cutters for fun sandwich shapes! Once again, thank you so much for all of you who voted for me. If you haven’t had a chance yet to snag your $2 coupon, click here. My sandwich is “Winter Wonderland”, but vote for what you really like because there’s NO WAY I’m winning at this point. Just be sure to snag yourself that coupon! Previous Post: « Reader Request: What Shoes Should I Pair With This Dress? 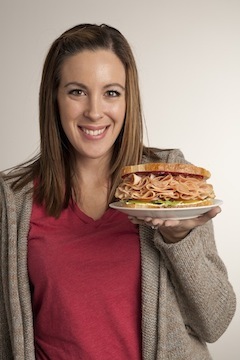 i’ve made your sandwich…..and it is great and i am a fan of the Girls and Boys Club of America too!! The whole “put a slice of meat next to each slice of bread and then the condiments is blowing my mind:-). i can’t believe I’ve been packing lunches for 17 years now and never thought of that!